Many caterers work from home, just like other business owners. Space can be a problem and renting premises or moving home can be expensive. What is the option? Rather than extend the property why not have a log cabin installed in the garden instead? A log cabin can be erected within one day and by two people. This is ideal for the busy caterer who needs space very quickly and cannot have months of disruption whilst extensions are being constructed. Depending on your needs the attractive log cabin can be a small room, a large room or even several rooms on two levels. We do tend to think of the Swiss design showing sawn logs, window screens and a veranda with flower boxes but is it possible to have a modern design that may be more in keeping with the property where it is to be situated. Many shed suppliers now stock the basic log cabins as do the larger do it yourself stores and online businesses. These companies have extensive websites that will give most information about the contents of the package and whether the purchaser will have to purchase further materials such as roof tiles and stain. Payment can also be made online although it may be prudent to visit the seller and view the building before purchasing. It is wise to check with the local planning department but as a rule any outbuilding under 15 square metres does not require planning permission. The building must not be higher than 2.5 metres or be within two metres of the properties boundary. The log cabin or home office must not be situated further forward than the main property. For local rules and regulations it is advisable to contact the local council office. Deliveries are usually made to the boundary of the property. Two people are needed to offload and erect the simpler of the cabins. Take time to read the guidelines appertaining to the erection before starting the build. The ground for the base of the log cabin should be level. Many people use paving slabs as a base but the perfect base would be of pre laid concrete. This can be delivered and poured into the prepared ground or the home owner can mix and lay the base themselves. Again this is not a long job and can be done within the day. 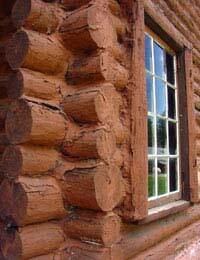 Power can be laid to the log cabin, many sellers can supply special packs of materials for the job. A registered electrician should carry out and test any electrical work undertaken in the cabin. If your log cabin is to hold equipment and stock that needs off loading and delivering you must ensure that the walkway between the cabin and your vehicle is accessible. If road entrances are required the owner will have to apply for planning permission. Basic hand tools will be required along with a set of ladders and a level. Log cabins are very popular as extra rooms and for home workers. When the time comes to sell your home the cabin will be an asset to the sale. Whether it be for leisure pursuits, pool house or home office the log cabin will be an attraction to the buyer.